"I wouldn't touch the Green Bay job. Everybody says, 'but you've got a Hall of Fame quarterback there?' Sure. But what else do you have?" Sky Sports NFL analyst, and Canadian Football League coach, Jeff Reinebold says if he were an NFL head coach he "wouldn't touch" the Green Bay Packers job, instead saying the Cleveland Browns vacancy is the more attractive of the two. 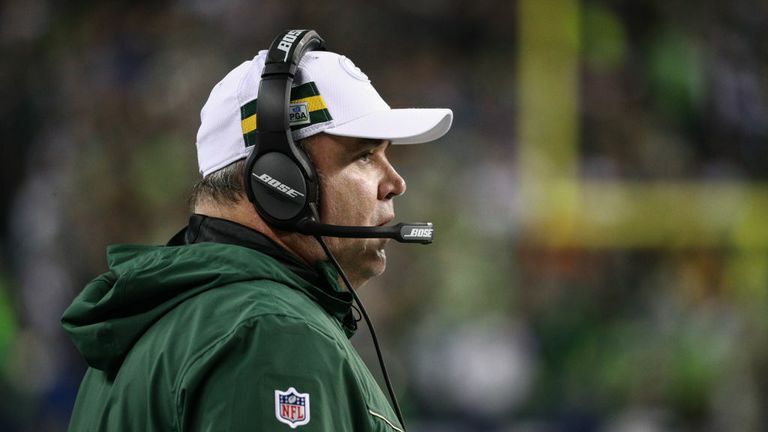 The Packers made the move to fire their 13-year head coach Mike McCarthy on Sunday, following a shock 20-17 home defeat to the Arizona Cardinals that saw them slip to 4-7-1 on their disappointing season. But, despite Green Bay having Aaron Rodgers at quarterback, Reinebold insists the Browns - who went 0-16 last season and fired Hue Jackson earlier this year - is the better gig. Speaking on the latest Inside the Huddle podcast, Reinebold said: "I wouldn't touch the Green Bay job. Everybody says, 'but you've got a Hall of Fame quarterback there?' Sure. But what else do you have? "You've got an unrealistic fan base, an undesirable free agency destination for players, a roster where the talent level is way down and a Hall of Fame quarterback who is 35 years old. "You can't put all the blame on McCarthy's doorstep. There's an awful lot to blame here. This team has not improved. "Go back to their Super Bowl winning team from the 2010 season, look at their talent level then and compare it to today. "Give me the Cleveland job. The Browns have young, talented players. And, all you have to do there is win 10 games and they'll probably build a statue of you." Is the Cleveland job, with young quarterback Baker Mayfield, a more attractive prospect? However, McCarthy's critics have suggested the team should have tasted more Super Bowl success during Rodgers' prime years at quarterback, while the relationship between the two is said to have become strained in recent times due to perceived conservative play-calling. Also speaking on Inside the Huddle, NFL.com analyst, and former cornerback for the Packers, Bucky Brooks agreed with Reinebold's assessment, however, that the team's struggles aren't just the fault of the departed McCarthy. A look at the big news stories in the NFL as Kareem Hunt is released by the Chiefs and Mike McCarthy is fired by the Packers. "What you have is actually a declining product," added Brooks. "This is a team, and quarterback, who haven't played well since the early part of the season. "The noise grew. All of the stories and reported innuendo about this disconnect between the coach and quarterback, and the team decided to make a move. The narrative probably became bigger than the story really was. "McCarthy came to Green Bay having had a lot of success running an old-school version of the West Coast offense. But, at the time, as Jeff says, he had better players. "Donald Driver, Greg Jennings, James Jones, Jermichael Finley. They could line up and beat anybody, so you didn't have to do a lot of stuff to win games. But now the talent has come down and they need more creativity to ensure their guys get open. Is future Hall of Fame quarterback Aaron Rodgers partly to blame for Green Bay's struggles? "The other problem you have: you have a quarterback who doesn't like to play on script. So, as a play caller, it is very hard to call plays for a guy like that. He is an artist, he wants to be creative. But, when that creativity goes awry, everyone looks at the coach. "Rodgers is partially to blame for their demise. He hasn't played like a top player. He hasn't done his job." With McCarthy now gone, who next for Green Bay? An offensive-minded coach is said to be the preferred choice, with the hope being that they can get the best out of Rodgers. It would follow a growing trend in the NFL of teams looking for a supposed 'quarterback whisperer' or 'the next Sean McVay', following on from the 32-year-old's staggering success over his first two years in charge of the Los Angeles Rams. "If you're looking for McVay, then you'd better go to Los Angeles," Reinebold warned. "He is such an outlier. A brilliant, outstanding coach, but they don't fall off of trees. "There's talk of John DeFilippo (Minnesota Vikings offensive coordinator). But he, in my opinion, is on a downward spiral in terms of the way teams are looking at him right now because of what is going on in Minensota. And Josh McDaniels (New England Patriots offensive coordinator) - can you trust him to take the job if you offer him the job?" McDaniels was announced as the new head coach of the Indianapolis Colts earlier this year, only to then pull out of the job on the same day. Brooks believes a more experienced candidate would be better suited to the role: "You need a big person, big personality to fill this job. This is not one where you can learn on the job. You'd better have someone who is experienced in dealing with the expectations of this organisation."